You can help Globals Make Some Noise and win a 7 night all inclusive 4 star stay in Salou for two! 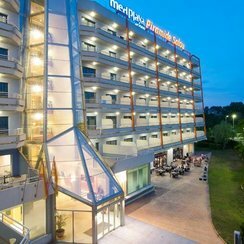 You will fly with British Airways to the popular Spanish resort of Salou where you will have 7 nights of all inclusive luxury in the 4 star Medplaya Piramide. To get involved and be in with a chance of winning, text the word SPAIN to 6 55 88. Entries close at 5pm on the 19th October. Keep your phone handy, we may be calling you. Texts cost your standard network rate, plus once you've entered we'll do the bit that raises the money for all those good causes and will automatically take a donation of £3, unless you text CANCEL as instructed in the first text message we send you. 100% of your donation will go to Global's Make Some Noise. You must be 18 or over to take part and available to travel from Glasgow ariport on June 1stor June 8th 2019. You’re playing across both Heart Scotland and Smooth Scotland. See the full Ts&Cs below. Global’s Make Some Noise is Smooth’s very own charity, supporting small but brilliant projects across the UK which help children, young people and their families living with illness, disability or lack of opportunity. Service Provider: Global Radio Services Ltd., 30 Leicester Square, London, WC2H 7LA. If you are having problems using our text entry service or feel a donation has been taken from your bill unfairly, please have a look at our FAQs at http://www.makesomenoise.com/premium-rate-phone-text-faqs/ or alternatively contact our customer helpline on 03333 212 196. 1. The following rules (“Rules”) together with Global Charities ("Global Charities") general and competition terms and conditions (the “Terms and Conditions”) (which can be found atwww.makesomenoise.com/terms-conditions/) apply to the ‘Global’s Make Some Noise Text Competitions’ ("the Competition") as detailed in the Rules. 4. To enter the Competition an Entrant must send a text message with the relevant keyword to one of the following radio stations shortcodes Heart – 82122 (SPAIN) Smooth – 65588 (SPAIN) (the “Text Message Line”). Text messages will be charged at standard network rate. If you text after the closing time you will not be entered but may still be charged. The Text Message Line will open at 16.00 on Thursday October 4th2018 (the “Opening Time”) and close at 17.00 on Friday 19thOctober 2018 (the “Closing Time”). number of the phone that their text entry was sent from. The winner may be required to answer their phone, talk to the presenter/s and a call recorded with the presenter/s and played on-air.if the call is not answered, goes to voicemail, or the entrant is driving, or the quality of the call is not sufficient for broadcast (at the Promoter’s discretion), the chance to win the prize will be forfeited. Another entrant will be selected as above. Unsuccessful entrants will not be contacted. 8. You must be 18 or over to enter the Competition and available to fly from Glasgow airport on 1stor 8thJune 2018. Both the winner and their companion must be 18 or over. 12. The prize is non transferable. 13. 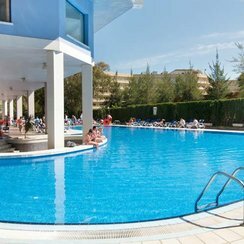 A 7-night all inclusive trip for two adults, 18 or over, to Costa Dorada, Salou in Spain, flying direct from Glasgow with British Airways (Barrhead Charter Programme) on 1st or 8th June 2019. Accommodation at the 4* Medplaya Piramide in a double or twin room with a balcony, on an all-inclusive basis. Prize includes 20kg luggage allowance and transfers. 14. No substitute prizes or cash alternatives are available. 15. The prize is non transferable. 18. These tickets are subject to space availability and are non-reroutable, non-transferable, non-upgradable, non-refundable and have no cash value. Please note that all passengers must travel together on both flights. 19. Seven nights’ accommodation in a double / twin room with a balcony. All-inclusive board basis based on 2 adults sharing. 20. The booking has to be made in advance, is subject to availability and non-refundable. 23. Shared transfers are provided between the airport and hotel in Spain only. -The content of the prize may be subject to change and/or substituted with a prize of equal or greater value. -We require winner name, contact number, postal address & email to facilitate the prize. -Due to the nature of prize donations, please be aware that it can take several weeks to confirm dates. -Not for resale, not transferable, there is no cash alternative. -This is a charity competition and as such no refunds are given. Service Provider: Global Radio Services Ltd., 30 Leicester Square, London, WC2H 7LA. If you are having problems using our text entry service or feel a donation has been taken from your bill unfairly, please have a look at our FAQsor alternatively contact our customer helpline on 03333 212 196.